If there’s one thing that Telltale’s really good at it’s playing with our expectations. Their dealing of third-party franchises has seen mixed results over the years, and while they’ve been mostly positive, there’s no helping feeling a little uneasy seeing them step out of their comfort zone. That was the case when it was announced that Batman would be the next property they’ve been tasked with handling, but after seeing through an entire season of the Caped Crusader in Telltale adventure form, it’s safe to say that their treatment of Gotham’s #1 vigilante was anything but terrible. Far from it, Telltale’s Batman series has taken DC Comics’ token character to some very interesting places, some of which that haven’t even been explored in the more than seventy years since his creation by Bob Kane and Bill Finger. Telltale boldly took their own spin of a Batman mythos and played around with the established norm, basically turning heroes, civilians, and, most importantly, villains upside down, shaking up what was expected of them and even throwing a few surprises in for good measure. The season finale manages to tie up all of the loose ends left by the series so far, thanks to the mostly strong development left by episode four’s aftermath. Bruce Wayne managed to come out of one of two possible messy situations as a possible savior for Gotham City, in a way that Batman could never really be. His buddy, now mayor and mentally unstable tyrant Harvey Dent poses as a threat that ends up being played down by the one that’s truly been pulling the strings all along, Lady Arkham, aka Ms. Vicki Vale, aka Vicki Arkham. In one of the most interesting and out of left field shake ups of the series, reporter extraordinaire and often Wayne’s sweetheart, turns out to be the none other than the terrorist who’s been laying siege in the city. Their inevitable showdown is quite a spectacle and turns out to be the ultimate highlight of episode five, making use of the dynamic (but still mostly on-rails) action gameplay that’s evolved throughout the season. There’s also plenty of investigative scenes as well, even though these haven’t caused quite the impression that all the action has. 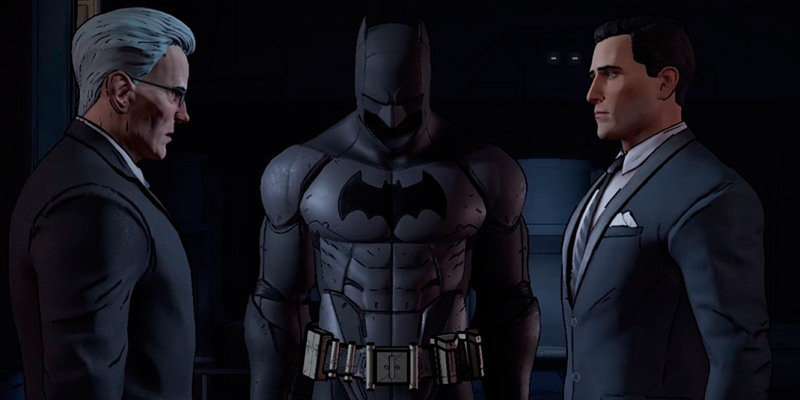 Still, seeing that most of the sleuthing Batman does in this episode isn’t quite sleuthing per se, more of an attempt to organize thoughts into a coherent string of events, it’s somewhat surprising that Telltale didn’t take controls away in order to keep the story going, allowing us to slow down with Bruce and collect our breaths. 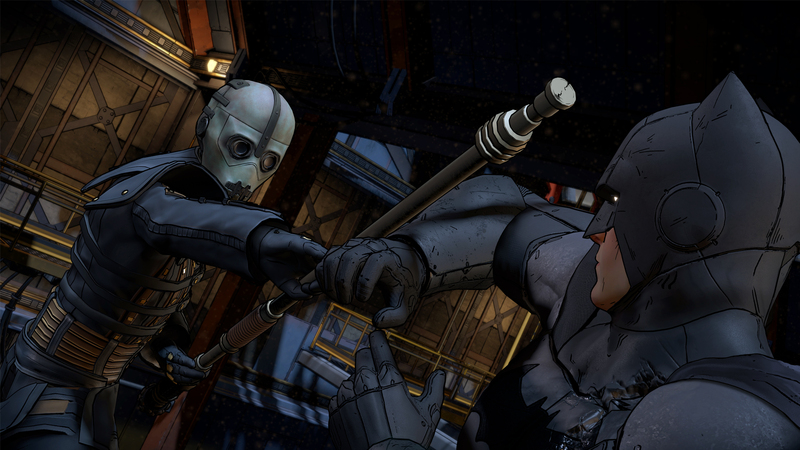 As a collected experience that takes place throughout five parts, Batman: A Telltale Series proved to be quite a ride, one which had its share of bumps along the way in the form of technical issues that at this point have mercifully been remedied, so if you’re only now just stepping into the series, you’re sure to have a much better time than anyone who’s been with it since release. In that regard, there’s some finger wriggling to be done to Telltale for putting out a game in such a state in the first place, but they’ve done their part with making sure that it ran continually better all through the season. I was able to play through the entirety of the finale in a single seating with no problems to speak of whatsoever, so props to them for eventually figuring these issues out, even if it happened this late in the season. Given their portfolio handling comic book franchises, I’m quite curious to see how Guardians of the Galaxy will shape up, especially considering that Telltale has the humor chops to match the tone of Marvel’s band of intergalactic adventurers given their pedigree with Sam & Max and co. Here’s hope that Batman eventually gets a second season. The foundation is set for an even better and technically more stable adventure if Telltale’s ever in the mood to toy with the Dark Knight again.